do i need a prescription to buy propecia purchasing viagra online for cheap If you believe, as I do, that future tax rates will be higher, you may benefit from opening a Roth IRA. Of the 5 ways people lose money, taxes are NUMBER ONE. There are many innovative strategies for reducing your tax burden and the Roth IRA is without a doubt the best IRA available today. Traditional IRAs allow you to contribute after-tax dollars up to the limits established by the government for any given tax year, then, if you are eligible, claim a tax deduction on your tax return for those contributions. For 2015, you can contribute a maximum of $5,500 per year. If you are age 50 or older by the end of the year you can make a catch-up contribution of an additional $1,000 per year*. When you withdraw money from a traditional IRA you will pay tax at the tax rate that applies to your income tax bracket at the time of withdrawal. Roth IRAs also allow you to contribute after-tax dollars, but you can no longer claim a tax deduction for the contribution. You give up the annual tax benefit on the contribution so you can take qualified distributions from your Roth IRA without paying tax on the earnings. This allows to you to avoid potentially higher tax rates in the future. What if tax rates aren’t higher in the future? If tax rates stay the same, or you somehow end up in a lower tax bracket when you retire, you may still be better off with a Roth IRA because you will have paid the taxes on your income when you can most afford it, during your income earning years, as opposed to when you can least afford it, in your retirement years, when every penny counts. Roth IRAs allow you to have access to your contributions (not your earnings) at any time, for any reason, tax and penalty free. That’s an attractive and very beneficial feature for those who want to save for retirement, but are worried about having to pay taxes or a penalty if they need access to that money. If you need to access the earnings before five years have elapsed, you may owe taxes on the earnings, and if you need the earnings for a purpose other than those listed above, you may owe a 10% early withdrawal penalty as well. The good news is that the way the IRS looks at things, the first money that comes out of a Roth IRA is your contributions. Roth IRAs, unlike other retirement vehicles, such as employer-sponsored 401(k)s, 403(b)s, and traditional IRAs, DO NOT have required minimum distributions (RMDs). That’s a BIG advantage because if you end up not needing the money the year after the year you turn 70 ½, you are not required to take any distributions. 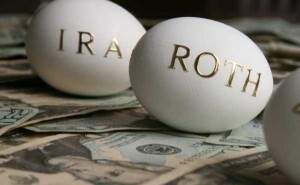 It’s important to note that RMDs are required upon the death of the Roth IRA owner. That means the heirs of a Roth IRA must take RMDs, but the RMDs are still tax free. Inheriting a Roth IRA is very similar to receiving the death benefit from a life insurance policy. Unlike a traditional IRA, distributions from a Roth IRA are NOT included in the calculation of “Provisional Income.” Provisional income is a measure used by the IRS to determine if an individual’s Social Security benefits are taxable and to what degree. It is also used to determine how much an individual will pay for Medicare premiums on a monthly basis. Roth IRAs allow you to continue making contributions after age 70 ½, as long as you are employed and earning income. Contributions can only be made from earned income. As life expectancy continues to expand many people are working into their 70’s and may want to continue contributing to their retirement accounts. However, if you earn less than the maximum contribution limit, you can contribute only as much as you earned. So if, for example, you earned just $3,000, you could contribute only $3,000 to a Roth IRA for the year. Non-working spouses can contribute the maximum amount to a Roth IRA as long as the working spouse earns enough to contribute to both accounts and the household income doesn’t exceed the IRS income-eligibility limits. Roth IRA income eligibility limits are not affected by coverage by an employer retirement plan. Those limitations apply only to tax-deductible contributions to traditional IRAs. An individual may contribute to both a traditional IRA and a Roth IRA. However, the maximum combined contribution is $5,500 (or $6,500, if 50 or older). 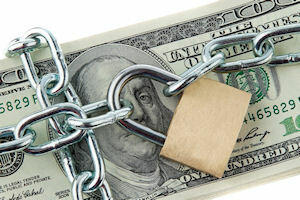 If your income makes you ineligible to contribute directly to a Roth IRA, there is method known as a “backdoor Roth IRA” that may allow you to contribute to a Roth IRA, but that is beyond the scope of this post. If you are interested in discovering how a Roth IRA and other innovative investment strategies we employ can improve your tax burden call us to schedule a time to discuss your specific circumstances. *The contribution limit for IRAs is subject to increase based on the inflation rate. 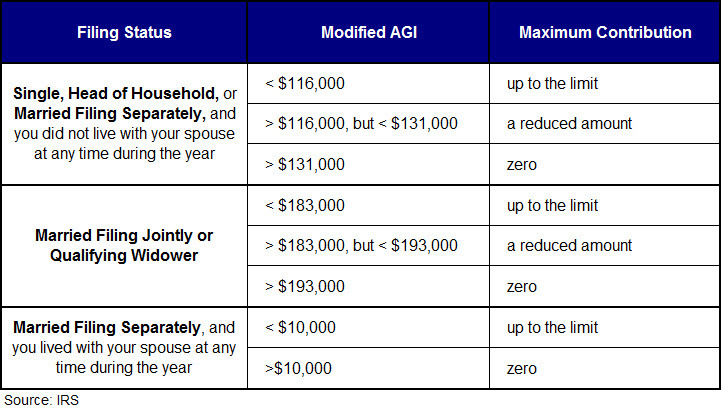 **The $10,000 limit is per person, so couples could withdraw up to $20,000 of earnings if they each have a Roth IRA.